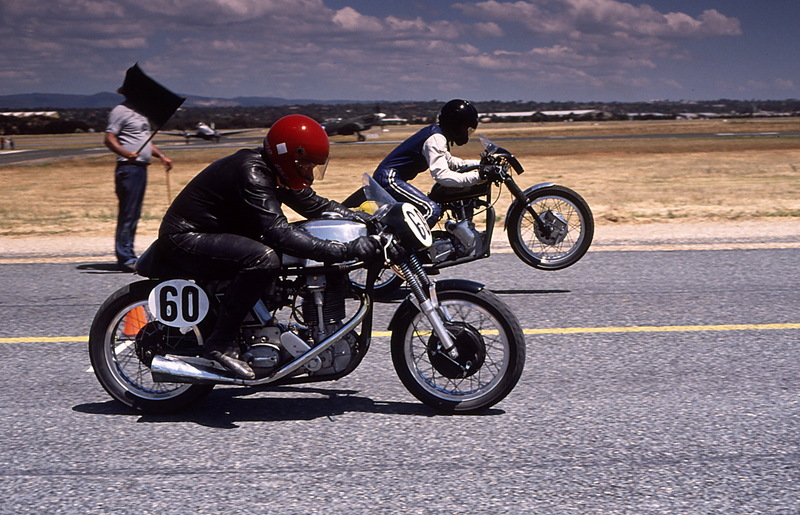 Jeff Evans aboard his 1950 Norton International and Neville Schubert on his 1956 MSS Velocette take on the Supermarine Spitfire MK V111 (background) in the feature event. The classic racing scene has become a worldwide phenomenon over the past thirty years or more. The highly successful Goodwood Festival of Speed was first held in 1993 followed five years later in 1998 by the Goodwood Revival that celebrates not only historic racing cars and motorcycles but also aircraft with spectators dressing in period costume to recreate the era. 1993 was also the year Adelaide had its own unique historic event in aid of charity. Below is my report on the meeting. 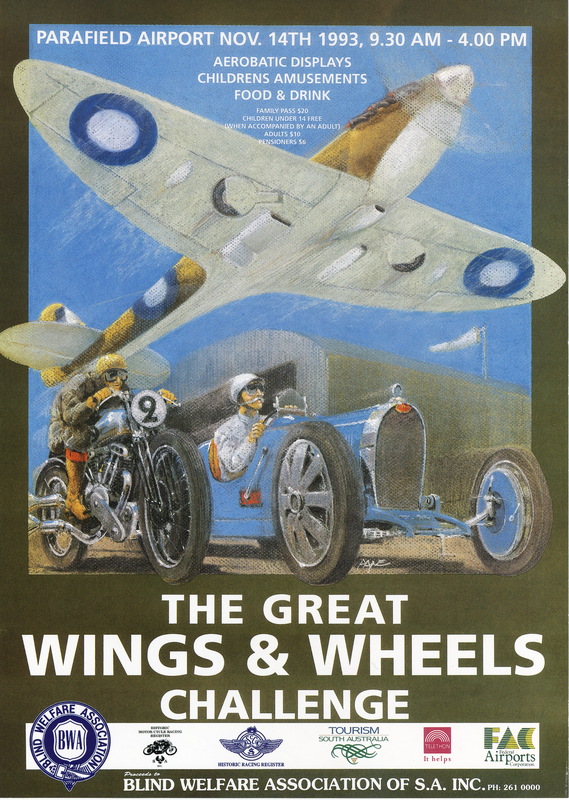 The idea for the Great Wings and Wheels Challenge was inspired by the writings of T.E. Lawrence – the fabled “Lawrence of Arabia “. It was Airman Lawrence’s exploits racing his “super tuned” Brough Superior SS100 motorcycle against the likes of World War One aircraft such as Bristol fighters and Sopwith Camels that captured the imagination of Blind Welfare fundraising promotions officer, and motorcycle racing enthusiast, Chris Wain. With the help of the Historic Motorcycle Racing Register, Tourism S.A., the Historic Racing Register and the Federal Airports Authority, this unique event was put together to aid the Blind Welfare Association by pitting historic motorcycles, cars and aircraft against each other. Held in absolutely perfect weather conditions on Sunday, November the 14th at Adelaide’s Parafield Airport, the organisers turned on an entertaining family event that was enjoyed by approximately 20,000 spectators. But how do you translate Lawrence’s daring races on public roads into an event contained within the safety conscious confines of Parafield Airport? The answer turned out to be really quite simple. By utilising three of the northwestern runways, it was possible to have the motorcycles, cars and aircraft race each other side by side over a measured four hundred metres. 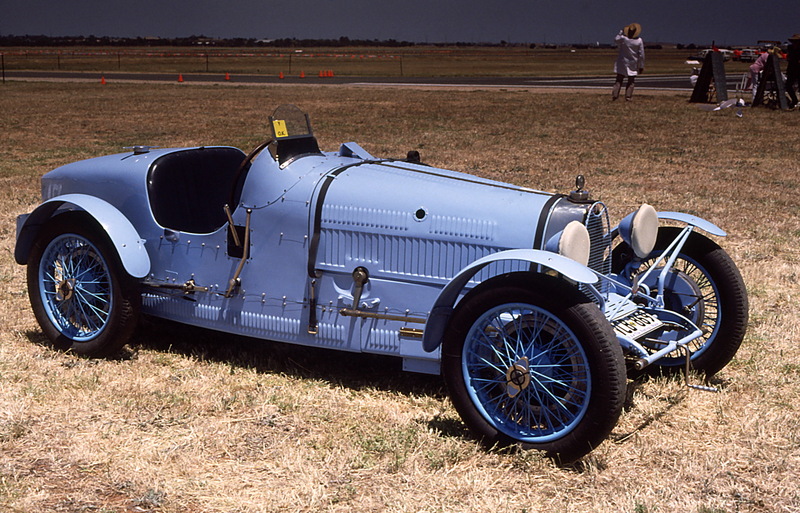 Kent Patrick’s magnificent Type 37A Bugatti. In the spirit of the era, well known “flagman”, Glen Dix, waved them away with each competitor’s progress being timed by hand-held stopwatch. With some sixty entrants in the car division and thirty-five in the motorcycle class, it was going to be quite a feat to get through the various categories before a final “top ten shootout” for the three divisions could be held. Each competitor though was guaranteed at least three runs, with their best time to be recorded on a special certificate and accompanied by a plaque. The air was filled with nostalgia as the time trials started with exciting machines for both motorcycle and car enthusiasts to watch and aircraft aficionados to admire. In the motorcycle class, these ranged from Doug Treager’s 1961 Manx Norton and Dean Watson’s 1948 KSS Velocette to Mark Schuppan’s 1962 pan head Harley Davidson outfit. The sight of Peter Graham’s vintage 4.5 litre Bentley and Kent Patrick’s Type 37A Bugatti whipped up images of Le Mans and Brooklands in the car class, which added to the atmosphere of the occasion, helped along with such classics as the SS100 (Jaguar) of Simon Finch and Don Davies MG TC special. Colin Pay taxies his Supermarine Spitfire MK V111. The aircraft were well represented too, including perhaps that most loved of bi-planes the Tiger Moth owned by Bryan Price and also the Boeing Stearman’s of Ivor Peaech and Tim Knappstein. The time trials, however, were not the only attraction of the event. The organisers had made sure there was a carnival atmosphere with plenty of sideshows, rides and static displays to admire. The latter included public access to the cockpit of an Avon Sabre jet fighter of the type used during the Korean War.The Southern Cross Trust also had on display their replica of the Focker V11 that carried Australian pilot Charles Kingsford Smith on the first aerial crossing of the Pacific from America to Australia in 1928. But the stars of the show for most were Colin Pay’s World War Two Supermarine Spitfire Mark V111 and the Hawker Sea Fury owned by Guido Zuccoli. It was the individual lunchtime acrobatics of these two aircraft that had the crowd enthralled. 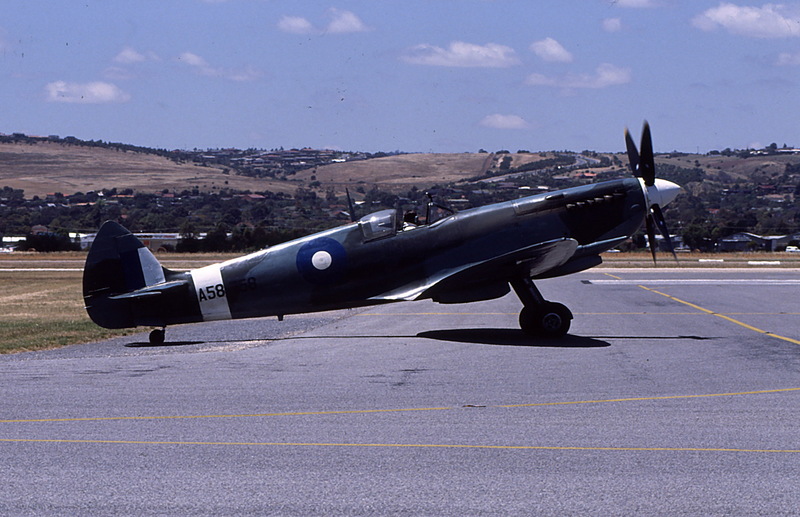 If the Spitfire could be described as swift agile and elegant, then the Sea Fury was fast furious and loud. 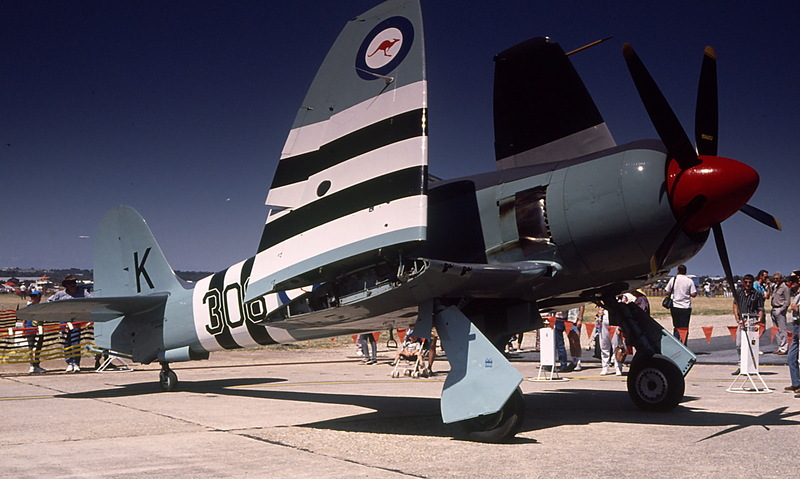 With 2,550hp on tap from its radial 18 cylinder engine, the Sea Fury is one of the most powerful piston engine aircraft ever built, and after seeing it in action, few would dispute this claim. Genuinely awe-inspiring stuff and a fitting build-up to the feature event of the day – a match race between a Brough Superior, the Supermarine Spitfire and a Type 37A Bugatti. 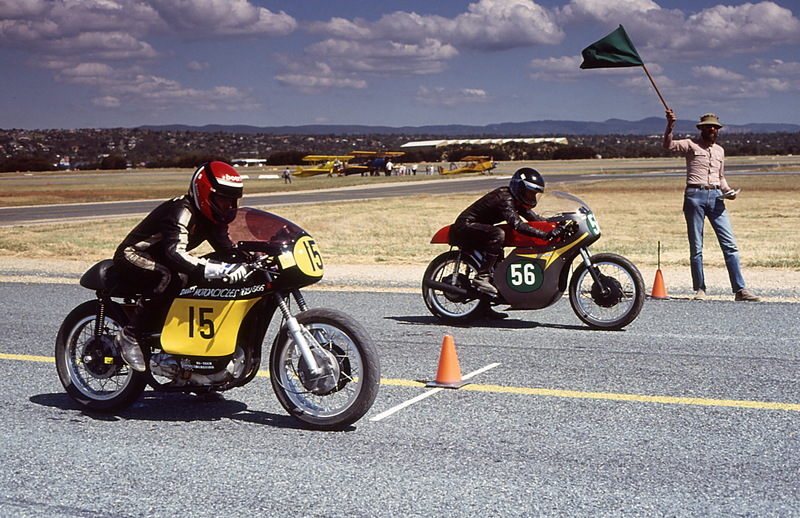 Time trials winner Andy McDonald on his 650cc Triton (15) lines up against Bob Eldridge on his Honda CB72 based racer. Unfortunately, this brought the only disappointment of the meeting when the Brough Superior was unexpectedly scratched. Neville Schubert’s 1956 MSS Veloccette and Jeff Evans 1950 600cc Norton International however ably filled its place. To the entertainment of the crowd, these classic and vintage competitors lined up against each other in a cacophony of revving engines as they waited to be flagged away. At the starter’s signal, they launched themselves off the line with the motorcycles scrambling to an immediate advantage, which they held to the finish line. The Spitfire, although putting in a creditable 17.38 seconds run, was no match, but it was still quick enough to beat home the vintage Bugatti. By now most of the vast crowd were suffering from a severe case of nostalgia overload, as the meeting started to wind down. The final runs of the top ten entrants were held for each class – although it would be the fastest pass the competitors had accomplished on the day that would decide the winner of the time trials. The most powerful piston engined aeroplane in the world the Hawker Sea Fury. And they were pretty close too, with eight competitors getting into the 13-second bracket in the motorcycle category and two in the car class. The overall winner and first in the motorcycle division went to Andy McDonald on his 1962 650cc Triton with a 13.04sec pass. Overall second and first in the car class was the Elfin of F. Greeneklee with a 13.12sec run while third place and second in the motorcycle category went to Wal Morgan on his 1962 650cc Tribsa with a time of 13.25sec. Worth a mention also is the effort of Neil Munro and Shane Edwards who came sixth overall with a13.47sec on their 1000cc Vincent HRD outfit. Perhaps not surprisingly the aircraft didn’t fare so well, with the best time of 16.0sec being achieved by Tim Knappstein with his Boeing Stearman. But the real winners, of course, were the public who got a unique opportunity to see some fantastic machinery compete against each other and in doing so contribute toward a very worthwhile cause. Words and photographs, Geoff Dawes © 1993. Published in British Bikes Magazine 1993. This entry was posted in Motor Sport, Motoracing, Motorcycle Racing, Motorcycling, Motoring and tagged 500cc Norton International, 650cc Tribsa, 650cc Triton, Boeing Stearman, Elfin, Hawker Sea Fury, MG TC, MSS Veloccette, Supermarine Spitfire MK V111, Tiger Moth, Type 37A Bugatti, Vinent HRD on 14/06/2017 by Geoff Dawes.